Category: Legwarmers, Strictly Stripes. Tags: alpaca, leg warmers, Sag Harbor. 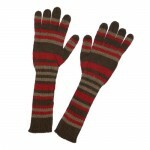 Hand knit leg warmers in red, chocolate and camel multi-stripes.